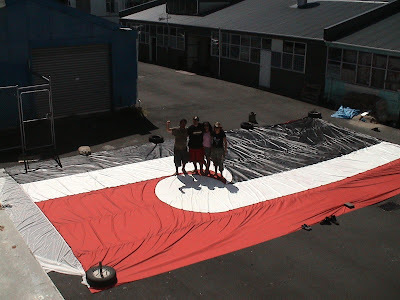 Members and supporters of the sovereignty group Te Ata Tino Toa gathered today to create the largest known Tino Rangatiratanga flag, in preparation for a 9AM Waitangi Day flyby over the Auckland Harbour Bridge as a response to Transit New Zealand’s stubborn dogmatic refusal to fly the flag themselves. 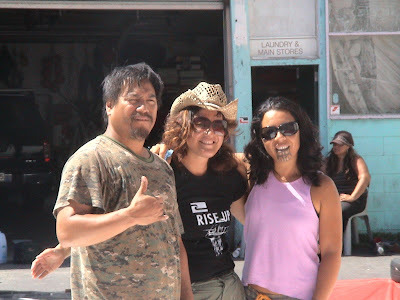 Te Ata Tino Toa is led by "Urewera 17" supporters Teanau Tuiono (left), Tia Taurere (right) and Kiritapu Allan. does this mean that all the seats in parliment are maori seats? Some activists want a seperate maori parliament, some want total control. Some want to expel non-Maori NZers. Some just want to play Che Guevara. John Key certainly helped Tama Iti's publicity campaign to appear too nice to be a proto-terrorist. Iti is the world's shortest, fattest, most camouflage clothed, but least camouflage faced pseudo-guerrilla. But he is wily! Financed by the leftist but State-owned TV NZ on his trip to Waitangi he outfoxed Key and Key's PR advisers. "he outfoxed Key and Key's PR advisers... Bring back Don Brash!" Maybe the National Party could hire him? An acquaintance in Christchurch tells me that in his Press yesterday, the picture of Key at Waitangi appeared to show Key with mud on his face. I didn't hear or read anything about such an incidence. Assuming my mate's paper didn't contain a one-off or few-off printing blotch, does Tama Iti have someone inside the Christchurch Press photography department? Trevor can you actually point to a reference to any TR activists saying they want to expel all Non maori from NZ, or are you jsut making stuff up again? Awatere's presence as an ACT MP is conclusive proof that Rodney Hide and Richard Prebble are involved in a communist plot. If Trev is to be believed; people who are in the same organisation are obviously of the same opinions, and if you believed something sometime in the past then you obviously believe it now. Can anyone down in Christchurch tell us whether their newspaper as well as that mentioned in the post above had a picture of Key with mud on his face. If so we need to know who threw it. TVNZ's leftist news staff endlessly repeated the video clip of Brash flinching with mud on his face. Why did they ignore this Key incident if it occurred? And why haven't our North Island papers shown us the picture? "nga toa o te motu you are all invited to a hui to be held at a marae somewhere in the bay of islands feb 2 to feb the 7th 2007.
the hui will discuss how we/us you and all of us are going to take back aotearoa from the baldyheads to expel the britishers, the kaupapa of the hui is to set a plan of action in place to assist in bringing this about, independence and self determination we will all decide as to what and how we move on this ideally we want to perform an action on waitangi day that will shock the world." "Can anyone down in Christchurch tell us whether their newspaper as well as that mentioned in the post above had a picture of Key with mud on his face." Didn't see it down here anon.